Today is Coach John Wooden’s 99th birthday. 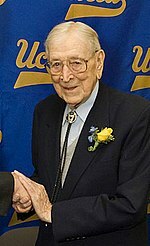 John Wooden is well-known as the UCLA basketball coach from 1948 to 1975, and for the basketball dynasty he created by winning 10 NCAA titles during a 12-year stretch from 1963 to 1975. He has written several books, and his latest one – “A Game Plan for Life: The Power of Mentoring with John Wooden” – is being released today. In the LA Times today, writer Mike Penner wrote 99 things you may or may not know about John Wooden. This article is like a mini-biography and provides highlights of his life. John Wooden is also famous for his Pyramid of Success which lists John’s 15 qualities of personal success. It took Coach Wooden over 15 years to fill in the boxes on his pyramid, and he views it as a ‘personal roadmap to pursuing, and at times, achieving Competitive Greatness.’ Wooden freely shares his pyramid, his wisdom and his approach to success. You can learn more about the Pyramid of Success and download a printable copy along with other resources from CoachWooden.com. Coach Wooden shared his philosophy on the difference between winning and success in this TED video in 2001. You can send birthday wishes to Coach Wooden through this website. The goal is to have 9,999 people wish him happy birthday and they are just shy of 3,000 currently. Take minute today to reflect on Coach Wooden’s Pyramid and to learn just a little more about this great man. 6/5/10 Update – please see my tribute blog post to Coach John Wooden who passed away on June 4th, 2010 for more information on John Wooden. This entry was posted in Uncategorized and tagged basketball, Coach John Wooden, Coach Wooden, inspiration, John Wooden, NCAA, personal roadmap, personal success, Pyramid of Success, TED, UCLA, UCLA basketball, video. Bookmark the permalink.